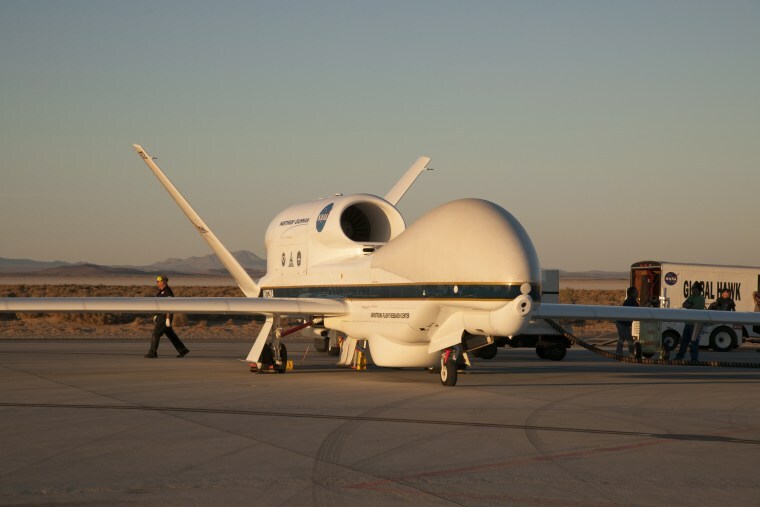 It may be called a "Global Hawk" but this drone looks more like a whale. The $130 million unmanned airplane was deployed by NASA and NOAA on Thursday from its base in California to collect data as Hurricane Matthew barrels up the country's southeastern seaboard. The plane can fly for up to an altitude of 65,000 feet and for 30 hours at a time if the weather permits, according to NASA. While in flight, Global Hawk is gathering scientific data about the storm. The data will also be used as part of NOAA's Sensing Hazards with Operational Unmanned Technology (SHOUT) mission to help inform future weather models. Hurricane Matthew weakened to a Category 3 storm overnight after slamming the Caribbean. However, with wind gusts up to 120 mph Friday morning, it still posed a significant risk for those in its path. Alyssa Newcomb is an NBC News contributor who writes about business and technology.